What makes us human, and where did we come from? How did a clever ape climb down from the trees and change the world like no other animal has done before? This large-format, highly illustrated book guides readers through the key aspects of the human story, from the anatomical changes that allowed us to walk upright and increased brain size in our ancestors, to the social, cultural and economic developments of our more recent cousins and our own species. Along the way, focus spreads take a closer look at some of the key species in our history, from the ancient Australopithecus Afarensis, 'Lucy', to our recent cousins the Neanderthals and ourselves, Homo sapiens. â? ?Looking beyond the anatomical evolution of humans, this book explores how our culture and way of living has evolved, from how trails of cowry shells reveal early trade between tribes, to how and why humans first domesticated dogs, horses, and farm animals, and began settling in permanent villages and cities. 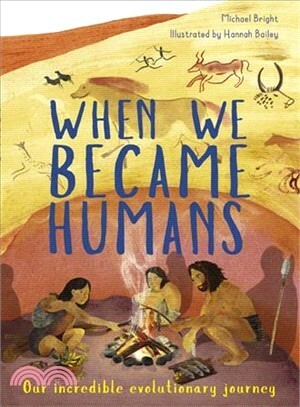 Through digestible information and absorbing illustration, young readers will be given an insight into their own origins, and what it really means to be a human. Michael Bright is an executive producer with the BBC’s Natural History Unit. He and his colleagues are based in Bristol, England, but they scour the entire world for stories and images. He is the author of over 75 natural history books, including Andes to Amazon; the producer of countless television and radio programs, including the award-winning television series Natural World and Wildlife on One; and has been editorial consultant on reference works, such as Discovering the Wonders of our World and The Wildlife Year. --This text refers to an out of print or unavailable edition of this title.